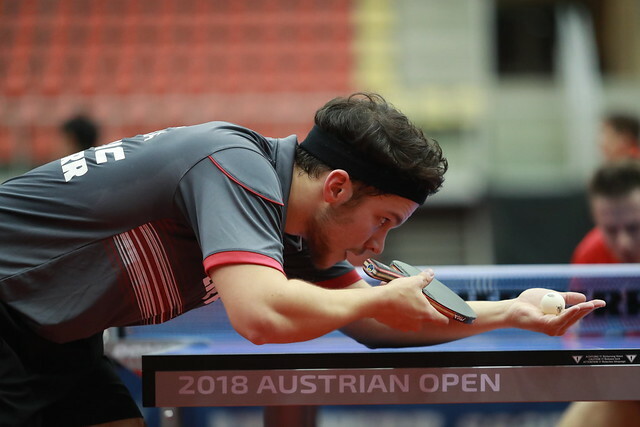 Gold medallists at the Liebherr 2017 World Championships in Düsseldorf, for Japan’s Maharu Yoshimura and Kasumi Ishikawa, there will be no such place on the podium in the Mixed Doubles event at the Seamaster 2018 ITTF World Tour Platinum Liebherr Austrian Open. On the morning of Friday 9th November they were beaten at the quarter-final stage of proceedings by the quite idyllic combination of China’s Xu Xin and Liu Shiwen (8-11, 11-8, 11-5, 11-9). Defeat for Maharu Yoshimura and Kasumi Ishikawa who started the tournament on the Standings at no.7 (175 points) but their quarter-final finish does mean they can expect an invitation to the Grand Finals in Incheon in December. Xu Xin and Liu Shiwen, competing for the first time together will not qualify for Incheon; a minimum two appearance criteria is needed. Conversely, Hong Kong’s Wong Chun Ting and Doo Hoi Kem, the no.3 seeds, by virtue of success against Slovakia’s Lubomir Pistej and Barbora Balazova (7-11, 11-9, 11-2, 11-4) can now anticipate a December date in Incheon. They started the day in what could be regarded the 10th spot (82 points) when the appearance criteria is taken into account; they now move into the top eight names. It is the same for Lubomir Pistej and Barbora Balazova, who when qualification for the Grand Finals is considered, commenced the day in the no.8 spot (89 points). Meanwhile, in the remaining quarter-final Mixed Doubles contests, it was success for pairs whose ticket to Incheon was already booked prior to the start of play. Chinese Taipei’s Chen Chien-An and Cheng I-Ching, the top seeds, beat Laurens Tromer and Britt Eerland of the Netherlands (7-11, 13-11, 11-9, 11-8); Korea Republic’s Jang Woojin and DPR Korea’s Cha Hyo Sim, the no.4 seeds, overcame Germany’s Ruwen Filus and Han Ying, the no.7 seeds and reigning European champions (11-5, 6-11, 11-9, 11-9). Hopes for a place in the Grand Finals for Ruwen Filus and Han Ying are now over; the started the tournament in an overall 24th position (19 points). At the semi-final stage Chen Chien-An and Cheng I-Ching meet Wong Chun Ting and Doo Hoi Kem; Jang Woojin and Cha Hyo Sim oppose Xu Xin and Liu Shiwen; the matches will be played later in the day in the evening session of play.